Tax-prep software and services all promise to make the annual IRS ritual painless by asking the right questions and then doing the math. But that doesn't mean they'll all arrive at the same bottom line. We ran a tax scenario for a fictional family through five popular tax-prep sites. The results? 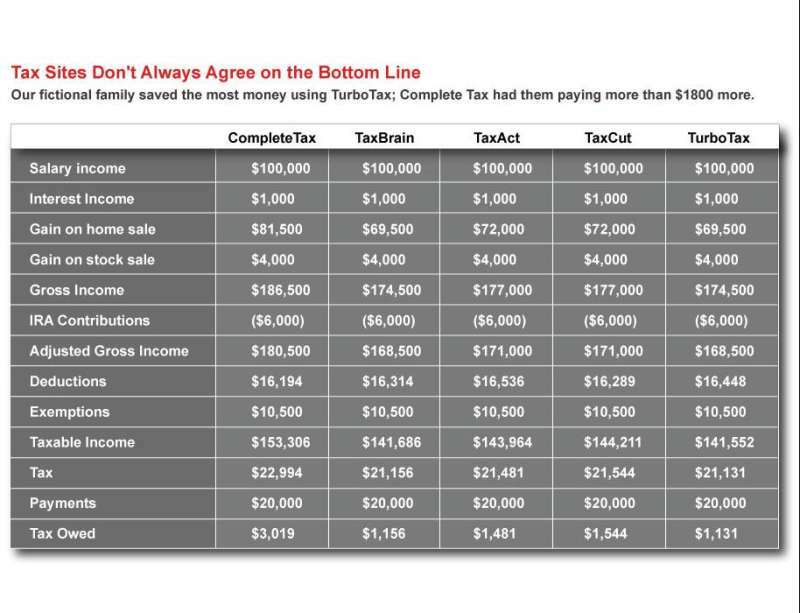 Each site told us that the family owed a different amount in taxes, and the difference between the lowest and highest bill was almost $2000, or about 10 percent of the family's total tax bill. Which site was correct? It's hard to say. The disparity in the returns (on a total tax bill of more than $20,000) stemmed from the instructions the tax sites provided (or failed to provide), but it also reflected a lack of concrete guidance from the IRS. The services I used for this experiment were the same ones I evaluated earlier this year for overall usability: CompleteTax, TaxAct, TaxBrain, TaxCut, and TurboTax. This time, however, I relied on the software's instructions and help to make decisions about some slightly more complicated (but hardly unusual) tax scenarios. My test family--let's call them the Smiths--was a couple with one child and a base income of $100,000, augmented by $1000 in interest income. They spent $6000 on childcare expenses, paid $1000 in student-loan interest and $12,000 in mortgage interest, and made two contributions of $3000 to IRAs. The Smiths had donated a pile of clothes and household items to charity sometime during the year. They had bought 100 shares of stock on January 1, 2008, for $5 per share, and then sold those shares on December 31, 2008, for $45 per share (lucky them!). Also in 2008 they sold a small vacation house for $179,000 (they had bought the house in 1990 for $80,000). The sale of the vacation home proved a real test for the tax-prep packages. All the sites said the Smiths could deduct costs associated with the sale of the home, but some were more precise about what types of expenses could and couldn't be included. For example, most sites made it pretty clear that the Smiths could deduct the $15,000 they spent in realtor's fees and advertising expenses, but what about the $2500 they spent on staging and painting to hasten the sale? When it came to specifics, CompleteTax, TaxBrain, and TurboTax either provided so little advice or such a long list of what counted that regarding the extra $2500 as selling expenses seemed reasonable. TurboTax was especially broad, stating that even home-inspection reports, geological surveys, and title insurance counted--items that together could easily cost hundreds of dollars each. Only TaxAct and TaxCut were clear enough about what counted and what didn't, explicitly stating that the Smiths should not include the extra $2500 as a selling expense. So what selling expenses are legal? 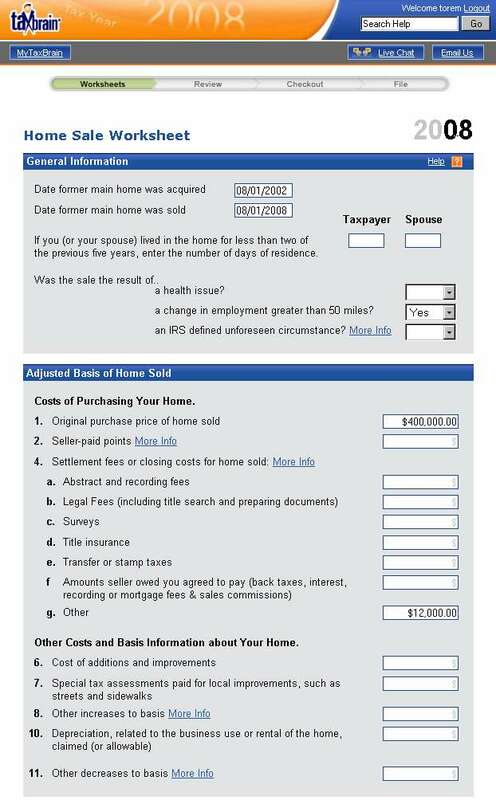 IRS Publication 523, "Selling Your Home," simply says: "Selling expenses include commissions, advertising fees, legal fees, and loan charges paid by the seller, such as loan placement fees or 'points.'" Painting is generally not an acceptable selling expense (usually it's considered a repair, according to Publication 523), and the jury is still out on whether staging is an advertising expense. Selling expenses on the home weren't the only problem. Four of the sites (TaxAct, TaxBrain, TaxCut, and TurboTax) told the Smiths to include purchase expenses such as realtor commissions and closing costs, which totaled $12,000, in the original cost of the house. That effectively reduced the profit on the sale, thereby helping to lower the Smiths' tax bill. Everyone can now use the Free File e-filing program--but it still has some limitations.